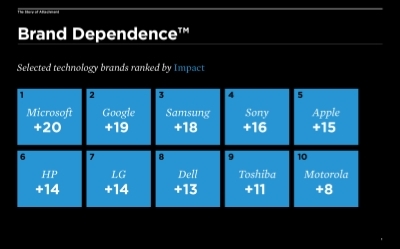 A study that measures consumer brand strength of consumer technology brands. According to UTA Brand Studio, Brand Dependence is a distinct measure of brand equity that determines how much people see a brand as being like themseves, sharing their values, and being an indispensable part of their lives. It is driven by brand-self connection and brand prominence.